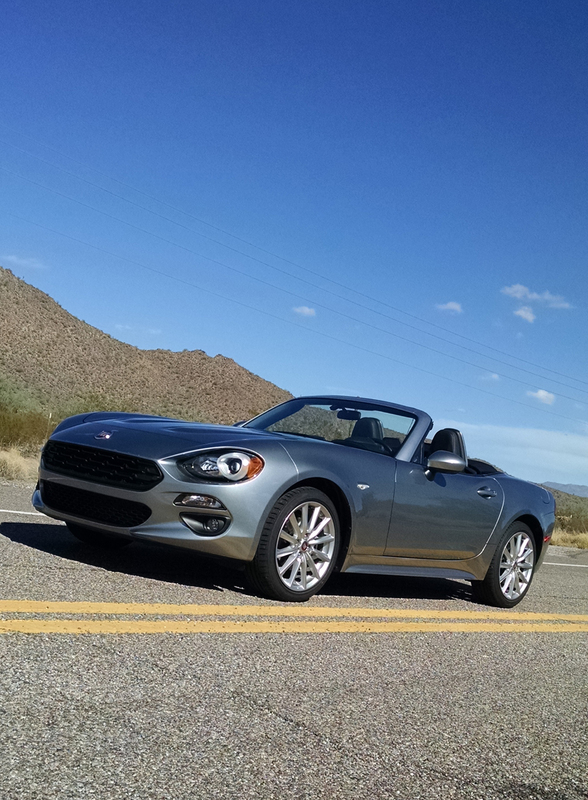 The Fiat 124 Spider returns in the new century, bringing with it the charm and heritage of the original that made its debut in the 1960s. Today however it’s got something different going on beneath its skin. 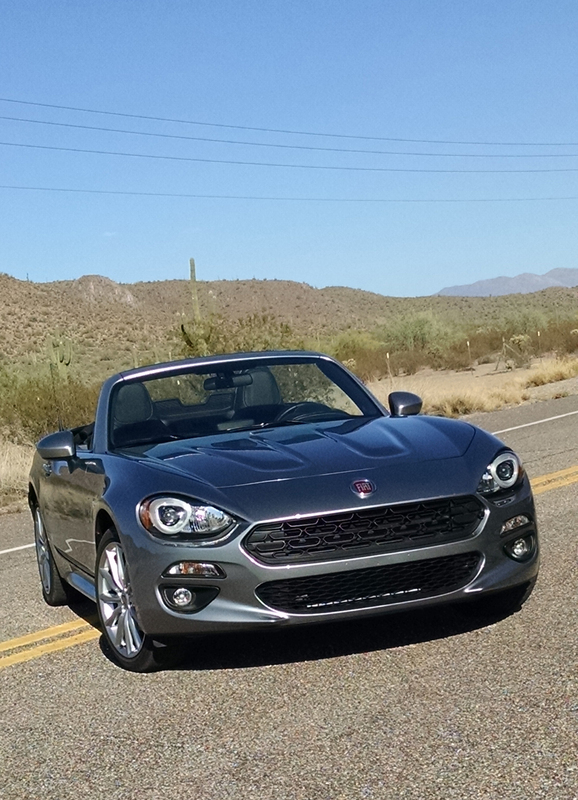 A few years ago, Mazda and Fiat jointly announced their next generation of roadsters would be developed together. 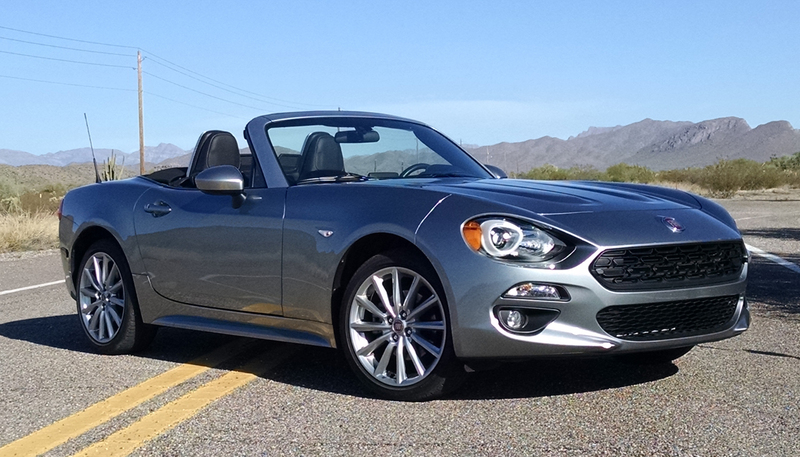 The Mazda MX-5 and Fiat 124 Spider would share a common chassis and assembly plant in Japan. 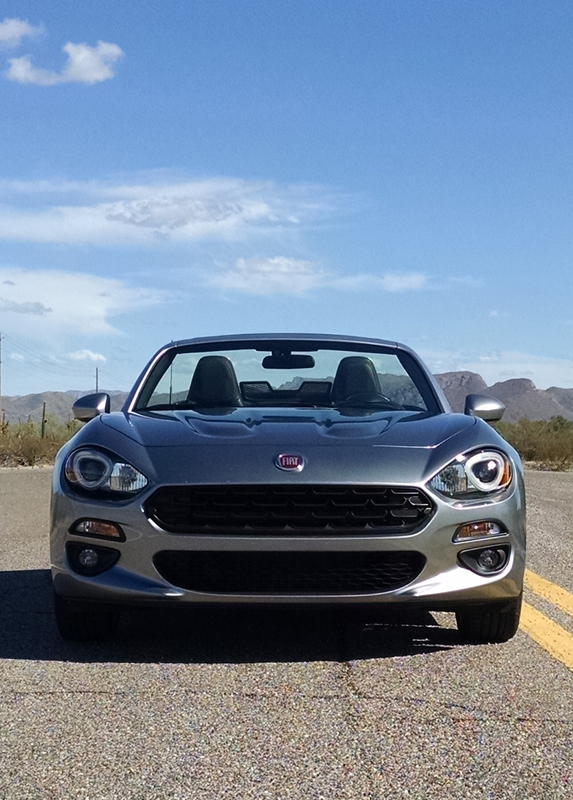 Fiat promised however their roadster would have classic Italian flair, styling and its own soul. 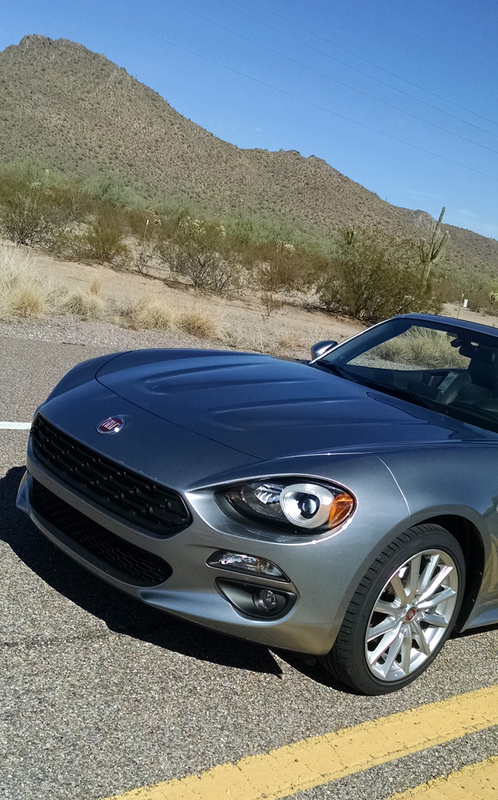 To wit, the 2017 Fiat 124 Spider indeed shares zero sheetmetal with the MX-5 and has its own distinct powertrain built in Italy. Styling takes on the form of the original classic Spider in theme with an artistic brush to forms in its front fenders, rear quarters and its stance. The face is clearly paying retro homage to is ancestor as are its upward canted rear tail lamps. 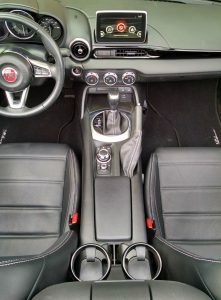 The Fiat 124 Spider comes in three grades, Classica as base, Abarth as top-end high performance and the Lusso mid-range as luxury that we have here. Pricing on ours with a six-speed automatic was $29,840 but you can start at $24,995 for a more basic model. Inside, the Lusso features heated leather seats with a unique stitching pattern from that of the Mazda but the rest of the interior is virtually identical save for a few trim pieces. This is both good and bad. The good, seating is infinitely comfortable for medium size human beings and smaller. The manually adjustable chairs fit like a glove and offer all-day driving comfort that never fades. 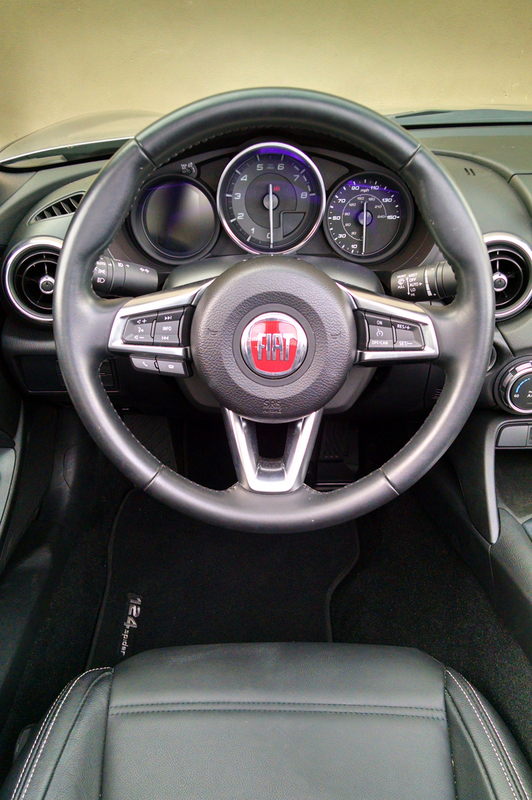 The driving position is excellent for visibility and maneuvering, though the steering wheel only offers a tilt adjustment. Materials and switchgear like the Mazda are of a good quality too. It’s when we start looking at ergonomic design that some things begin to annoy. First are the cup holders located to the rear of your elbow. They’re impossible to reach and use while driving. One can be plucked and moved to the forward center console for the driver to use. If you have a passenger it will be fighting with their knee. 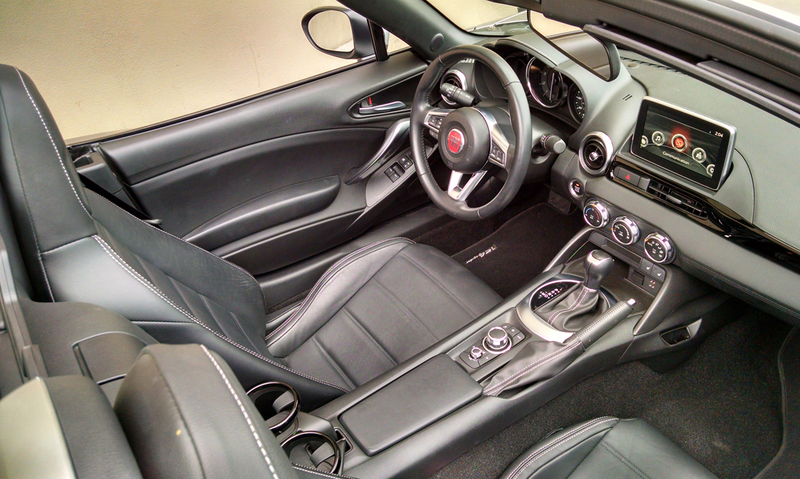 The other major gripe is the infotainment system that we also had misgivings for in the MX-5. 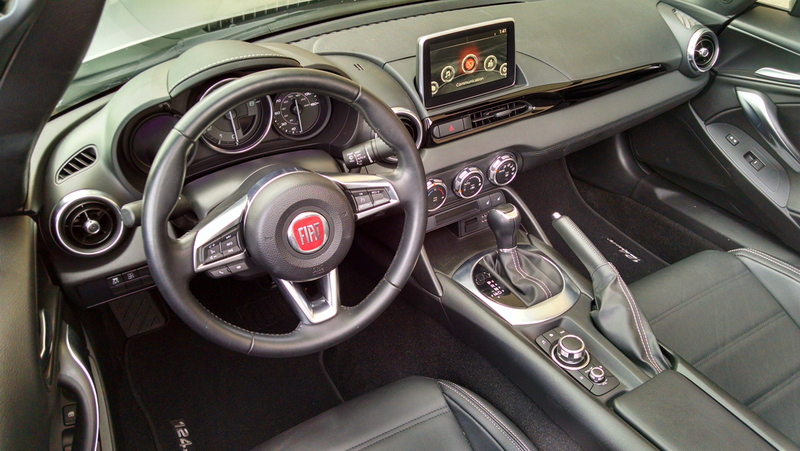 A floating touchscreen sits on the dash with a central control hub located far back on the console. The two knobs and buttons become a necessity after your speed exceeds five mph when the touchscreen stops allowing you to use it. Reaching the controls on the console is awkward because of their rearward position, and your elbow is constantly jabbing the aforementioned cup holders while doing it. Secondly, the menu system and intuitiveness of this system really lacks. Add this to mediocre sound quality and it really just needs a redo. 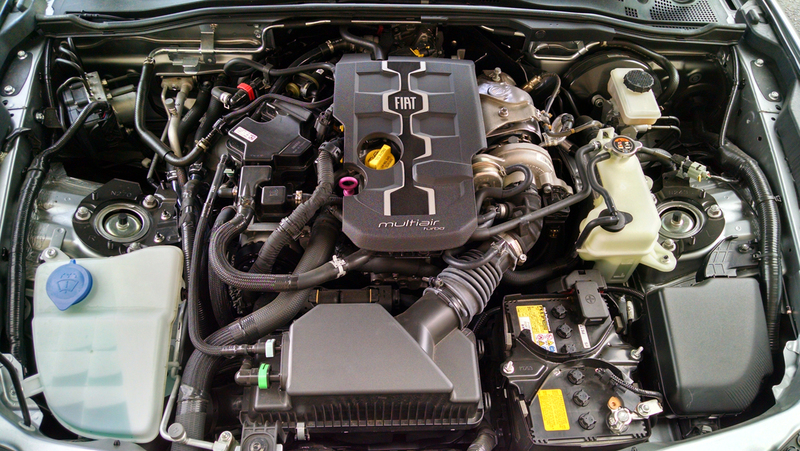 Luckily what’s under the hood doesn’t. The Fiat 124 Spider features the same 1.4-liter turbocharged four cylinder engine from Italy you’ll find with the popular Fiat 500 Abarth. 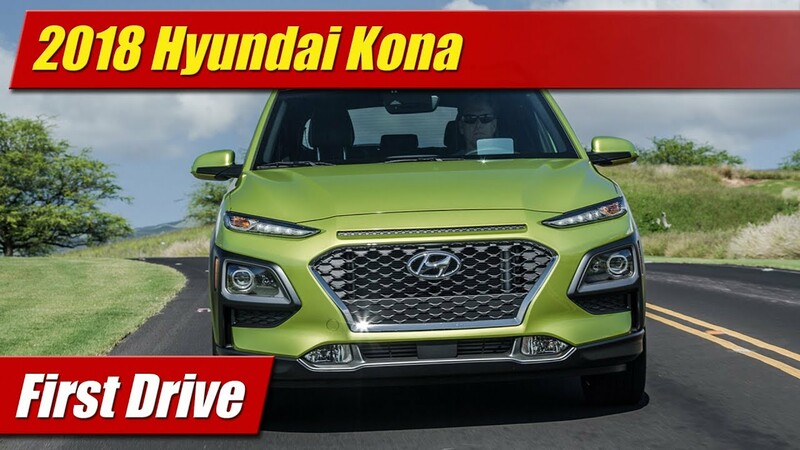 It has 160 horsepower and 184 pound-feet of torque and is available both with a six-speed manual or an automatic as ours had. 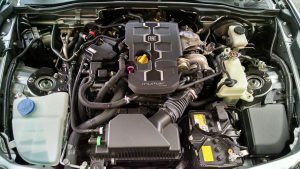 Even with the automatic transmission, the engine provides a nice kick in the back on back road jaunts and shifts crisply for stop and go driving in town. 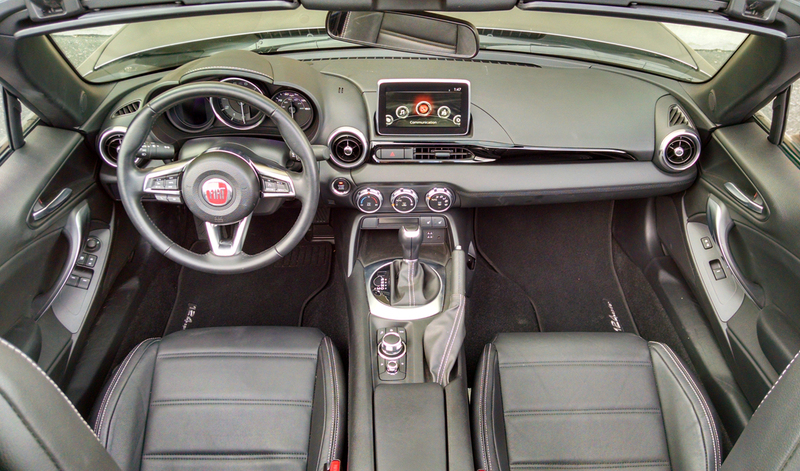 We’d prefer a manual in a car like this but the automatic is far from being a downer. We do wish for a more exotic exhaust note however given the Italian roadster theme. If you want more here, the Abarth model does offer a bit more rasp in addition to a tighter handling and braking scenario. 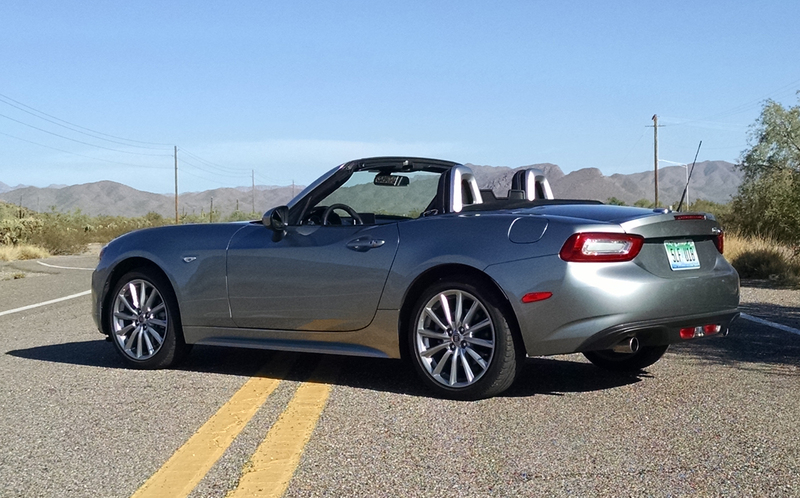 On handling, the suspension tune is slightly different than the MX-5, perhaps more subtle. 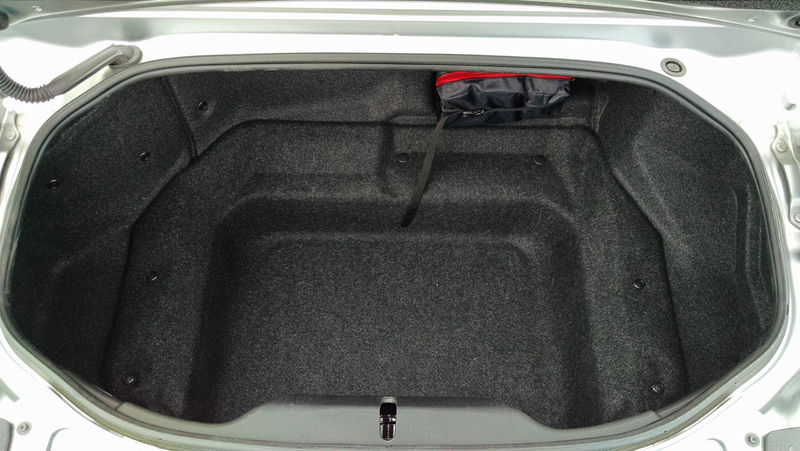 The car does weigh about 100 pounds more than the Mazda and feels the weight. 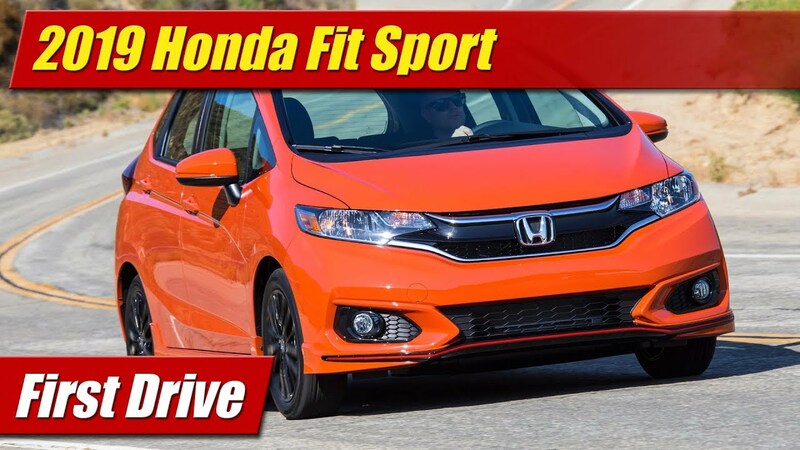 It does however offer all the precision and sharpness that makes it such a joy to drive fast or at a relaxed pace. 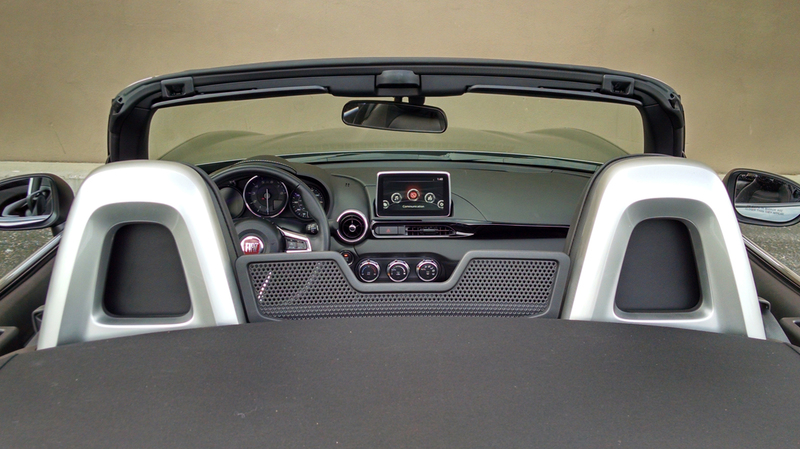 There is a little bit of cowl shake expected in a convertible and wind noise at highway speeds can be overcoming without the side windows up. At moderate speeds conversation is at ease without raising your voice. 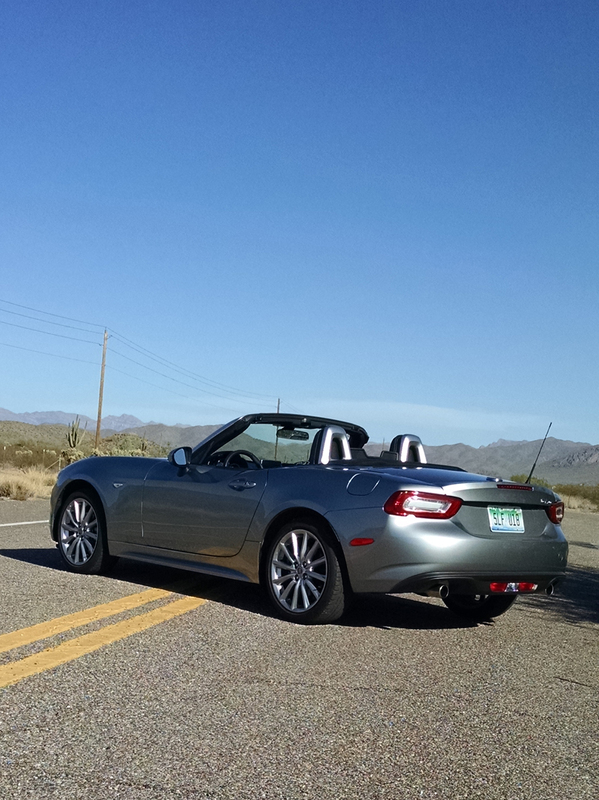 Our takeaway is that the Fiat 124 offers all the goodness of the Mazda MX-5 its based on but in an entirely different flavor. That’s a good thing. Perhaps best is that you can have the classic Italian roadster with classic Japanese build quality. 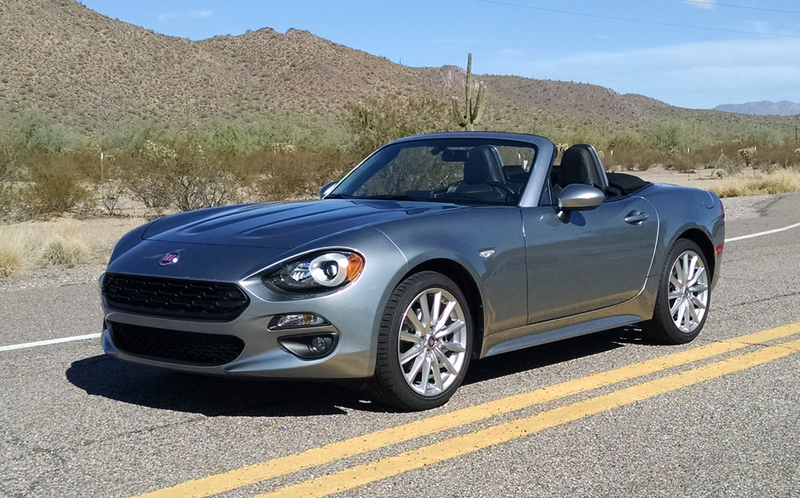 That alone makes the Fiat 124 Spider worth a look.